Thirty-three years ago in <?xml:namespace prefix = st1 ns = "urn:schemas-microsoft-com:office:smarttags" />New Orleans, Louisiana, a taste sensation was born. What began with one small restaurant and one big idea turned into a craze that swept the nation and the world. Today, Popeyes has more than 1,818 restaurants in the U.S. and 27 international markets including Puerto Rico, Japan, Germany, Korea, United Kingdom, Mexico, Panama, Honduras, Jamaica, Saudi Arabia, Indonesia, Guam, Canada and Jordan. In 1999 system sales were more than $1 billion. Popeyes Chicken & Biscuits is recognized as the leading brand in the Cajun segment of the foodservice industry for its food that appeals to flavor seekers around the globe. Its Cajun culinary heritage represents a unique flavor and menu variety that sets it apart from the competition. 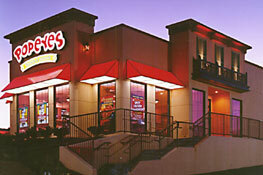 The Popeyes Business Support Center provides state-of-the-industry franchise support for our franchisees. Everything from site acceptance to training to marketing support is just a phone call away. To help with opening your restaurant, you'll receive support from the experts on our Market Development Team. Prior to opening your restaurant, you'll attend a training program at our state-of-the-art facility in Atlanta. We'll also send a team to help train the staff of your new restaurant. Once your restaurant is open, you'll be assigned a single point of contact from our Franchise Support Team who will help you choose and implement business-building programs. These programs are designed by the experts in their field to provide tools to help and support you as you work to become a successful Popeyes franchisee. Additionally, we continue to develop and implement many in-restaurant operations improvements to deliver our delicious New Orleans-style menu to our customers more efficiently than ever before. We continuously evaluate our systems, from drive-thru to back office to production and point-of-sale to provide our franchisees the best programs available to support their restaurant operations. Popeyes is currently seeking multi-unit food service investors who are interested in adding Popeyes to their portfolio. Popeyes requires that you meet our minimum financial requirements and agree to develop a minimum of three (3) restaurants over a pre-determined period of time. To learn more about the Popeyes Chicken & Biscuits restaurant franchise opportunity, simply complete the form below.